Roseline Remans is an associate research scientist working on the link between agriculture, the environment, and nutrition at the AgCenter and as consultant with Bioversity International. 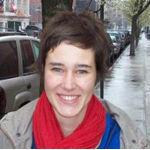 Roseline has a master and PhD in biosystems engineering from the University of Leuven, Belgium. Her PhD focused on interactions between soil microbes and beans (Phaseolus vulgaris) and how these interactions affected nutritional quality of beans in different environmental settings. For that work, she partnered with CIAT in Colombia, the National Soils Institute in Cuba, and el Centro de Fijacion de Nitrogeno in Mexico. After her PhD, she joined the Earth Institute in New York, supported by a European Marie Curie scholarship, to investigate potential synergies and tradeoffs between agriculture, the environment, and human nutrition in the Millennium Villages Project. There she got familiar with the Econutrition work started by Fabrice DeClerck, Cheryl Palm, and Richard Deckelbaum, and elaborated further on it, together with public health, agriculture, and environmental scientists and practitioners in a diversity of African settings. Roseline is now based in Addis Ababa, Ethiopia, at the ILRI campus, working on three main projects: Nutrition Sensitive Landscapes – applying a landscape approach to improve nutrition while considering environmental health; Vital Signs – an integrated monitoring system for agriculture, ecosystem services and human well-being (www.vitalsigns.org); and the Millennium Villages Project – a multi-sectoral development effort to achieve the MDGs in a variety of African settings (www.millenniumvillages.org). Remans R., Pronyk P.M., Fanzo J.C., Chen J., Palm C.A., Nemser B., Muniz M., Radunsky A., Abay A.H., Coulibaly M., Mensah-Homiah J., Wagah M., An X., Mwaura C., Quintana E., Somers M.A., Sanchez P.A., Sachs S.E., McArthur J.W., Sachs J.D., 2011. Multi-sector Interventions to Accelerate Reductions in Child Stunting: An Observational Study from 9 Sub-Saharan African Countries, American Journal of Clinical Nutrition 94: 1–11. Roseline R., Flynn D.F.B., DeClerck F., Diru W., Fanzo J., Gaynor K., Lambrecht I., Mudiope J., Mutuo, P.K.K, Nkhoma P., Siriri D., Sullivan C., Palm C.A. 2011. Assessing nutritional diversity of cropping systems in Africa, PLoS ONE 6(6). Sachs J., Remans R., Smukler S., Winowiecki L., Andelman S.J., Cassman K.G., Castle D., DeFries R., Denning G., Fanzo F., Jackson L.E., Leemans R., Lehmann J., Milder J.C., Naeem S., Nziguheba G., Palm C.A., Pingali P.L., Reganold J.P., Richter D.D., Scherr S.J., Sircely J., Sullivan C., Tomich T., Sanchez, P.A. 2010. Monitoring the world’s agriculture. Nature 466, 558–560. Negin J., Remans R., Karuti S., Fanzo J.C. 2009. Integrating a broader notion of food security and gender empowerment into the African Green Revolution. Food Security 1: 351–360.